This book is too large to be a field guide, so what is it? We envision it residing on bookshelves and car seats, ready to be consulted when a field guide doesn't provide enough information. Want to know the details of subspecies variation within Common Eider? The timing of the Cerulean Warbler migration? What a Mangrove Swallow looks like? 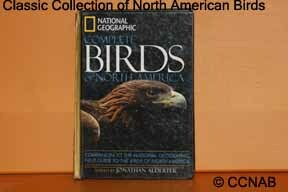 Here you'll find answers to myriad questions, in a single book; the National Geographic Complete Birds of North America. Here are illustrations of every accepted North American species (and a few that are waiting in the wings). You'll find in-depth information on identification, similar species, geographic variation, voice, status and distribution, population, and range, through the latest maps. This reference describes all species of wild birds reliably recorded in North America, the continent north of Mexico, plus adjacent islands and seas within 200 miles of the coast, excluding Greenland. With a cut-off date of September 2005, this book's last included species was Social Flycatcher. An unsubstantiated species may be included because it must be excluded before making an identification, such as Nazca Booby from Masked Booby on the West Coast. We include exotic species that are established or regularly observed, a subjective call in some cases, and one that evolves.